The FEI World Equestrian Games are currently being held in Normandy, France. The events are mixed but there are many women competing, especially in dressage. Olympic equestrian was male-only until 1952, in fact, until that year, it was only open to military officers – non-coms need not apply (note: there were some women in 1900 but that Olympics was very odd in many respects). In 1952 women were allowed to compete in dressage, and Lis Hartel inspirationally won a silver medal in individual dressage, despite still not being able to walk normally from the effects of polio. In 1956 jumping was opened to women, but it was not until 1964 that women could compete in three-day eventing. Since 1964, more and more women have competed in Olympic equestrian, especially in dressage, which is now dominated by women. Let’s look at how the proportion of female equestrian competitors has changed since 1964, and also what percentage of medals have been won by women. 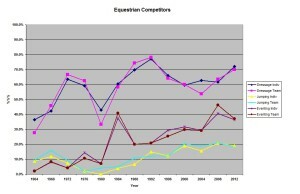 Here are the overall percentages of competitors in the 6 equestrian events from 1964-2012. 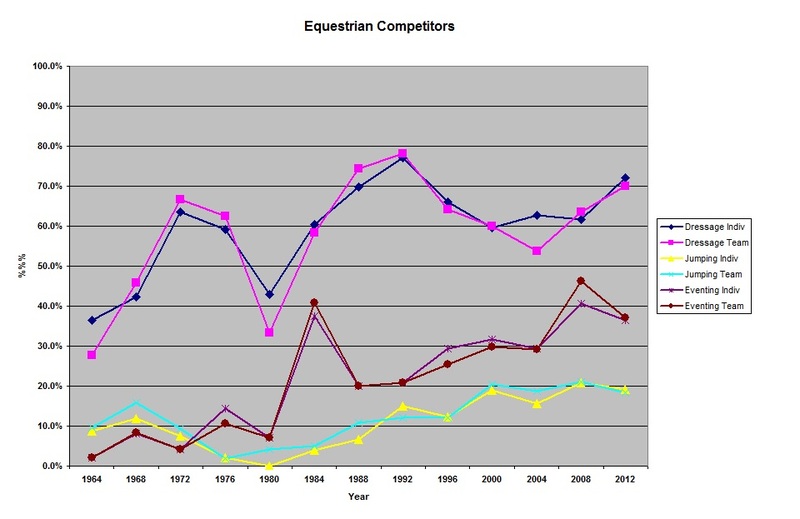 As you can see, all three disciplines show increasing numbers of women, although strangely, it is relatively flat for show jumping, and the percentage of women in show jumping is oddly low at about 20% from 2000-12. 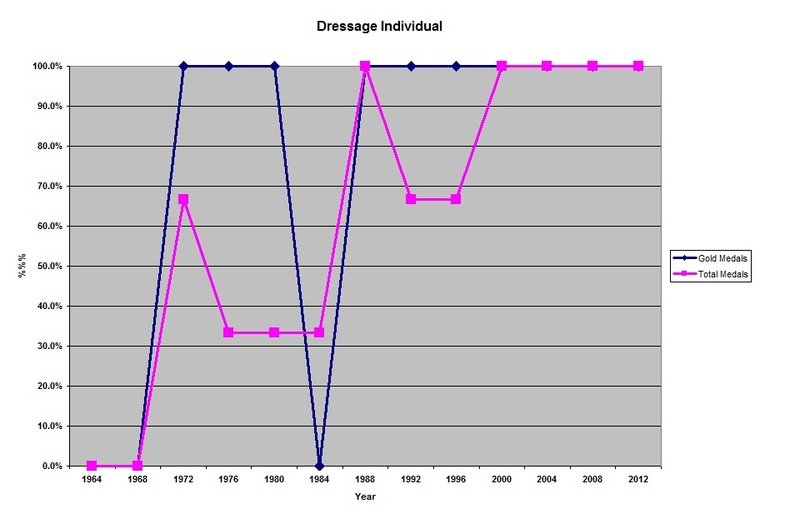 Dressage is dominated by female competitors now, and females have made up more than 50% of dressage riders since 1972, save for the anomalous 1980 Olympics (there were very few women riders that year in any event). 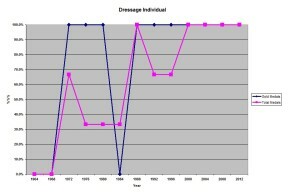 Eventing is intermediate between dressage and show jumping, but those curves show definite increasing slope, meaning more and more women competitors at each Olympics in each discipline. How about medals and gold medals? First, we’ll show charts for dressage, but remember, in all of these, for individual gold medals, its all or nothing – 0% or 100%. Once again, women are picking up more and more medals in dressage, in both events. There has not been a male medalist in individual dressage since 1996, and since 1988, men have won only 2 of 21 medals in that event. 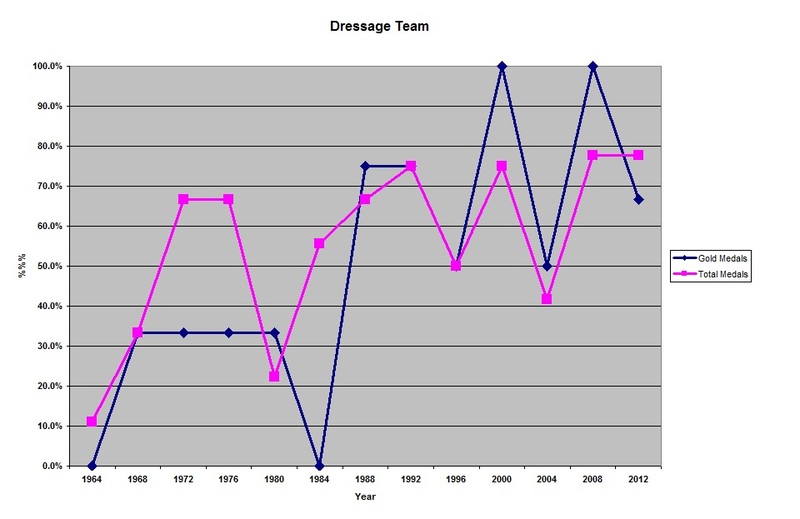 In team dressage, women have won over 50% of the medals at each Olympics since 1972, save for 1980, and also 2004. They have also won 50%+ gold medals since 1988, with all-female teams in 2000 and 2008. 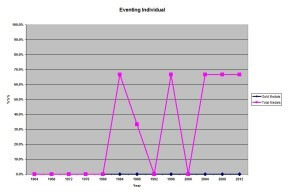 Now on to eventing, with charts for both individual and team events. A few things are noteworthy. A woman has not yet won an individual eventing gold medal, but they won 2 of 3 medals individually in 1984, 1996, and 2004-12. In team eventing, the medalists have been about 50% women since 1996. 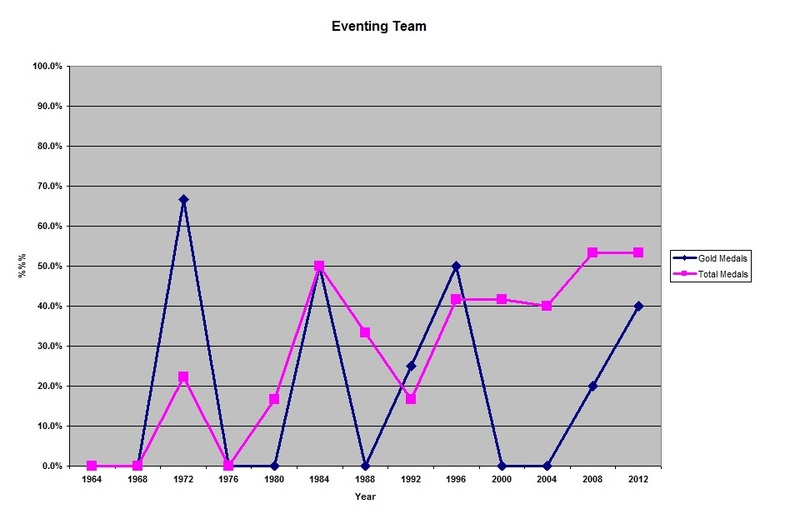 The gold medal stats for team eventing are all over the place. 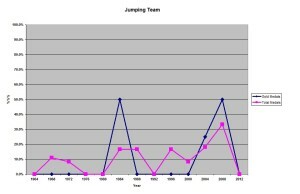 And finally, the anomalous discipline of show jumping, with both individual and team event charts. As in eventing, a woman has yet to win individual gold in show jumping. In fact, women have individually won only 1 medal in 1968-72, 1984, 1996, and 2008. 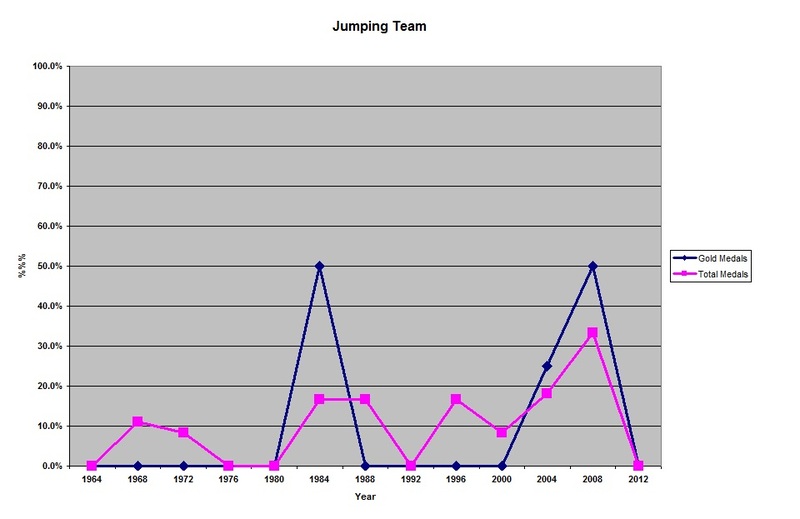 In team jumping, its not much better with women winning only 50% of the team medals in 1984 and 2008, and 0 medals in 1964-76, 1988-2000, and 2012. It is difficult for us to explain why women are so relatively under-represented in jumping, especially in comparison to eventing, which would seem to be the event which might have fewer women. We have no good explanation.